Amanda Crider has sung with the Dallas Opera, New York City Opera, Florida Grand Opera, The Castleton Festival, Glimmerglass Opera, Opera Boston, Opera Omaha, Des Moines Metro Opera, and Eugene Opera. She will make her European debut in Prague this summer as Nana in Jan Jirasek’s opera R.U.R. She has sung with New World Symphony, Louisiana Philharmonic, Eugene Symphony, Apollo’s Fire, Seraphic Fire, Bach Festival Society of Florida, and the International Contemporary Ensemble. 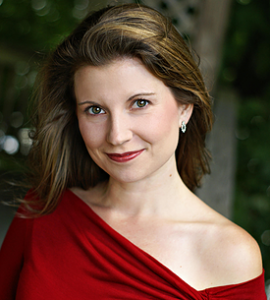 Ms. Crider has been a prize winner and finalist in the José Iturbi International Voice Competition, Jensen Foundation Voice Competition, Palm Beach Opera Vocal Competition, Oratorio Society of New York Vocal Competition, Center for Contemporary Opera Competition, and is the Artistic Director of IlluminArts.